We have mourned the end of the OFM residency at the Three Compasses recently as they migrated their trade South of the River. But lament-us-not, as we discovered another burger vendor nestled into the welcoming bosom of Hackney, hopefully to fill their ambrosial shoes. Having previously plied their trade to the ravenous hep youths at Catch bar on Kingsland Road, Yeah! are now housed a bit down the way in The Star of Hackney Downs. And it seems they fancy themselves the flashy noveltymongers of the London scene, having showcased a ramen burger as a previous special and, more recently, presented a scotch egg-bunned number, hoping to raise the eyebrows of apathetic East Londoners. 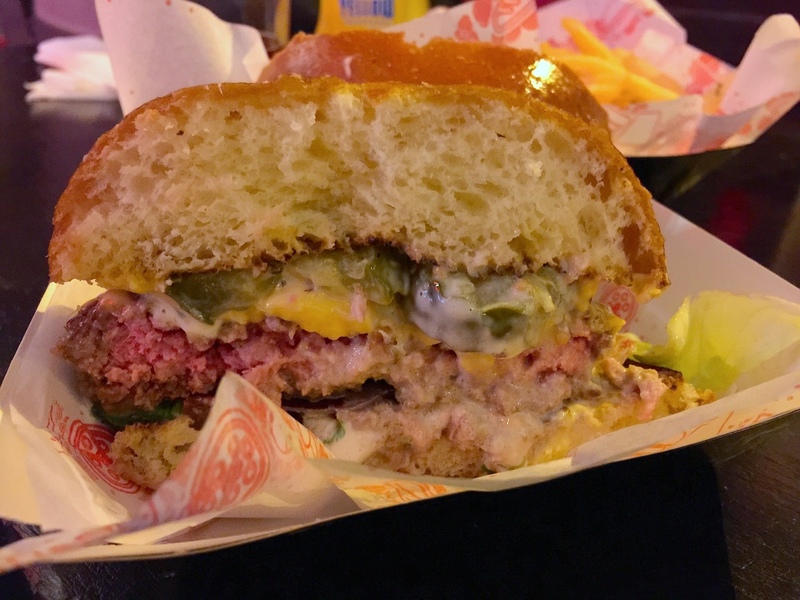 Familiarity and nuance sit across from one another on the menu, as alongside the standard burgers/dogs/sides are a quinoa-based veggie burger and oysters among other Mexican-tinged items. The Yeah! burger arrived sleek-bunned, complete with lakes of drippy white sauce slipping down a thick well tempered cheese-capped patty. A seductive bubbled-tan luster, toasted on the underside just staining the edges hid the light, fluffy-crumb of the bun. Rather decent. The thick layer of lucid American cheese was delightfully melted into surrender on the well seasoned and nicely pink meat, a squishy and savoury double-team. Torrents of the signature Yeah sauce is poured over thick slices of pickles and dribbles down onto the additions of lettuce, red onion and tomato which add the familiar sourness and crunch. The condiment has creaminess mixed with a nice burger sauce sweet tang, but suffers from an aqueous fluidity creating a very sloppy handful almost instantly. The Hell Yeah! adds a couple of tasty slices of crispy but pliable streaky bacon and a pleasing undercurrent of rich, tangy stilton into the blend which both diversifies and improves the all round flavour. However the doubling up of patties makes the balance inconsistent and meat heavy. There are few double patty attempts out there we would endorse, but this is not one. But single-patty this is a rather becoming, if not worthy, attempt. The sides we tried let the burgers down substantially, the Jar Jar Binks of edible sidekicks. The Don fries which promised rosemary and parmesan delivered comically little of both in volume and therefore taste. The description of the wings as buffalo style could be considered a loose interpretation as they resembled more of a poorly crusted, watery sweet chilli concoction - a real let down to those who had visited to sample Randy's Wing Bar in residency here previously. But we'd be content coming back for the sandwiches, and getting saturated in this pub, sitting on the corner of the street like a boozy miniature Flatiron. The Star chain has done a decent job of kitting this dinky boozer out, retaining a general pub aesthetic whilst adding low-lit red bulbs and fatigued chandeliers - creating their own brothel funfair, complete with carousel horse adorning the bar. The slightly divey feel at night gets no neighs from us.